You deserve a little something special every day of the week, so Abby Singer's is serving up delicious daily deals starting October 2! Daily specials are available for dine-in only at the bistro or in the movie theater. Make your dinner reservations at 318.459.4125. $10 TUESDAYS: We’ll feature one of our menu favorites that you love for $10 for lunch or dinner each Tuesday, starting with our famous shrimp & grits on October 2! 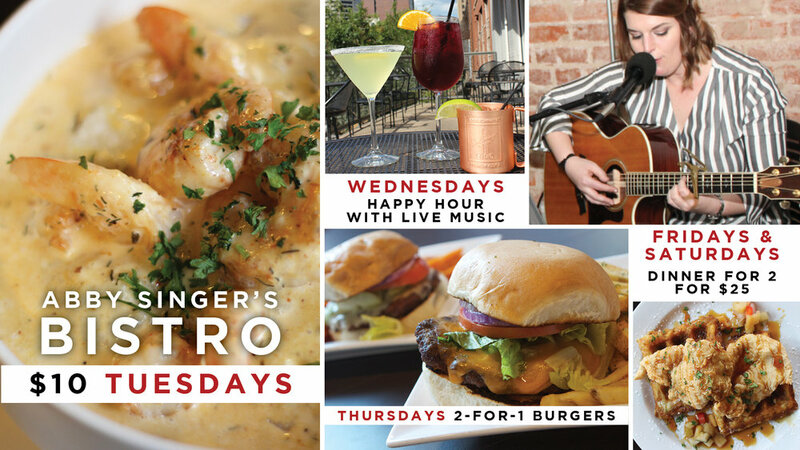 HALFWAY TO THE WEEKEND HAPPY HOUR WEDNESDAYS: You love live music and happy hour specials, so we’re bringing you both to get you through that midweek slump! From 4-6:30 p.m., domestics are just $2 and craft beers are $2.50. Of course we haven’t left out your favorite custom cocktails for $5, wine for $5, well for $4 and half-off your favorite appetizers including Singer Rolls, Duck Nachos, and more. 2-FOR-1 BURGER THURSDAY: That’s right. Two is always better than one, so we're bringing you two-for-one burgers on Thursdays. Royale and Cheese, anyone? DINNER FOR TWO ON FRIDAYS & SATURDAYS: Make your weekend plans with a friend or a date, because the new Dinner for Two selections for Fridays and Saturdays are meant to be shared. You get two entrees and a sharable dessert for just $25 … a deal so good, you’ll wish the weekend would stick around a little longer.